Before this summer, I wouldn’t have thought of Quakerism as raw material for board or card games. Several games of Unable, Unwilling, a satirical card game based on Quaker nominations, while I was at YMG this year changed my ideas. On 29 November, twenty or so Friends gathered to play Unable, Unwilling, and Journey Home (a new board game based on Jennifer Kavanagh’s book Journey Home), formed the basis for a games evening in the Quaker Centre at Friends House on 29/11/2011. The humour of Unable, Unwilling is recognisable to anyone who has been a part of Quaker nominations. Each player draws cards and attempts to nominate other players to jobs in the Meeting, ranging from the realistic (Clerk, Overseer, Treasurer, etc.) through the sublime (‘Quaker Concern for Random Left Wing Causes Rep’) to the ridiculous (‘Solidarity with Antarctic Friends Committee rep’). Each job comes with a certain number of stress points; once you have been nominated to jobs totalling fifteen stress points, you have lost the game, burn out, and write an angry letter to The Friend about overwork! There are also cards that enable you to deflect a nomination (for example, by pleading overwork, or by nominating another ‘worthy Friend’ to your left, and so on). Even the nominations process is accurately modelled, with names being put on the Noms Committees’ agenda for consideration. The games I played at YMG were an excellent ice-breaker with Friends I hadn’t met before, as well as causing much laughter because of the shared recognition of what was being mocked. It stands up as a game, too, though it is probably not as enjoyable outside Quaker circles owing to the subject matter. But it’s a loving send-up, and manages to poke fun at Quakerism without traducing it – a fine line to tread. Journey Home is an altogether different game. I’ve always had a mixed attitude to board games, which in my family always meant competitive games in which my dad, who is excellent at forming strategies around defined rules, winning hands down. Usually, this would have been preceded by the rest of the family losing interest. I was interested by Journey Home both because of its unusual subject matter, its reflective nature, and because I liked the idea of a game whose purpose seemed not to be victory, but reflection. 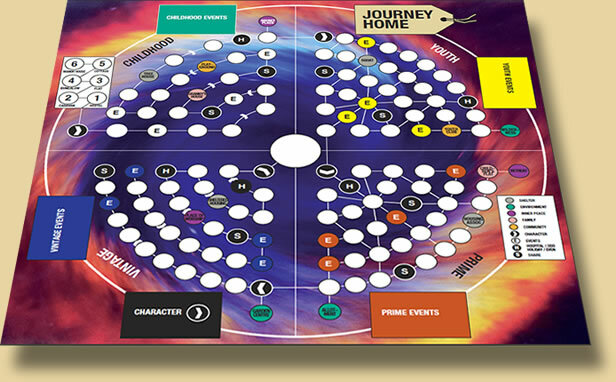 Players move through four quadrants on a board corresponding to Childhood, Youth, Prime and Vintage, moving along set paths in the first and last, and freely moving across the board in the middle two. Each player starts at home, is born in a different position in life, has certain life-long qualities, and is faced with certain events and choices. Each event or choice results in the player gaining or losing tokens that represent the different aspects of feeling at Home: Shelter, Environment, Inner Peace, Family, and Community. What I liked about the game was the discussions it initiated: faced with an event that poses a moral choice, the player makes a decision and then other players discuss what its effect will be on that person’s personality, awarding or taking away tokens accordingly. These discussions make the game a lot more reflective than most board games, and it’s this free-form element that I enjoyed the most; it makes the game as competitive or non-competitive as you want it to be. The openness and adaptability of the rules was interesting. One player treated it like a conventional “race to the finish” board game, racing at maximum speed towards the end of the board, and feeling afterwards that he had not encountered as many interesting events as he had hoped. I opted to stay for a lot longer in the Youth and Prime areas of the board, deliberately landing on Event spaces and enjoying the reflection they prompted. I’d like to play the game again with people I already know. Unable, Unwilling is available from the Quaker Centre bookshop. Phone 020 7663 1030. Visit http://journeyhomegame.com to purchase Journey Home or order through the Quaker Centre.